Now that my kitchen has fully recovered from the Dante incident, it’s time to get back to that garlic soup I mentioned. I guarantee that once you make this, you’ll be hooked. Given the power of garlic as an immunity booster to guard against cold and flu, and the sheer comfort and warmth a good bowl of sopa de ajo provides, I doubt you’re ever going to crave plain ol’ chicken soup again. 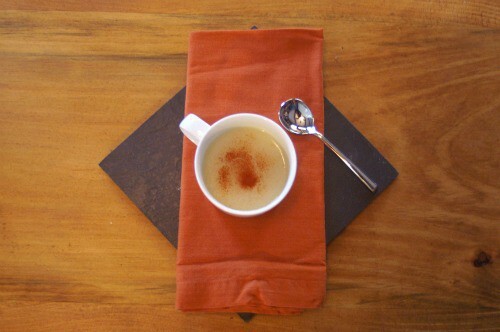 I first tried sopa de ajo at Dali, a wonderful tapas restaurant in Somerville, MA. On a cold night, this soup hits the spot like none other. It’s just a simple, silky, golden broth of garlicky warmth. You can literally feel it heating up your body with the first spoonful. Described as purely vegetarian on the menu, I asked our waiter what was the key to its silky texture if not cream. He replied to say that the main ingredient was bread. Whuh? Each sopa de ajo recipe I found was different. Some had floating garlic cloves while others had finely minced garlic swimming among croutons. A couple of recipes called for Serrano ham, many had you frying croutons and garlic first and adding it to the water, and several, including Martha Stewart’s, recommended that you add a poached egg. These all sounded delicious, but I really wanted to replicate what I had at Dali. I found one description sans recipe that said sopa de ajo is the simplest, most traditional peasant food from the Pyrenees mountains that requires only country bread, garlic and water. So with that, I decided to cook by instinct. I heated up a pot of chicken stock, some water, 5 crushed cloves of garlic (stems removed) and let it all get boiling. Then I threw in about 2 cups’ worth of torn day-old bread (no crusts) from a loaf of Balthazar Tuscan bread bought at my local grocery store. I suspect any hearty white country bread will do. I let it all cook until the garlic was soft, added some salt, and then plunged in my hand blender (a food processor or food mill would work just fine, too) and there it appeared—the golden, silky soup I enjoyed at Dali. I recommend poaching an egg in your soup and then serving it with a slice of that same crusty bread. You may also want to sprinkle a little smoked Spanish paprika on top, just to make it over the top good. If you find garlic hard to digest, use elephant garlic which is much milder and sweeter. Elephant garlic to regular garlic is like a leek to an onion. Speaking of which, I have potatoes and leeks in the fridge right now….